Hello lovelies!! 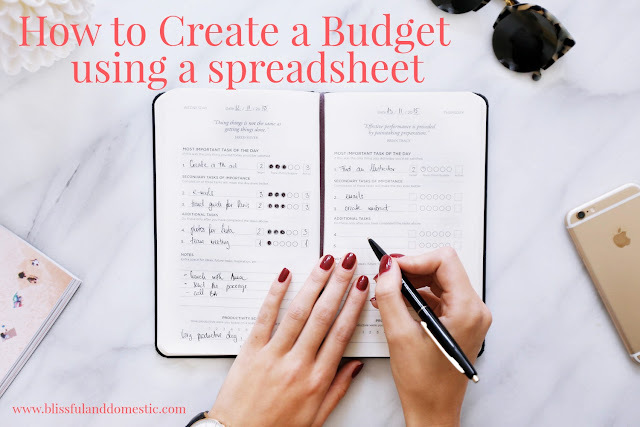 This afternoon I carved out some time and filmed a video for you all on how to create your own budget using the spreadsheet method. This is a simple way to create a working budget, that you can customize for your family. Before we get into the how to of budgeting, I wanted to take a quick minute and talk about why budgets are so stinking important. The first reason being that budgets are your game plan for the month. They let you know how much money is coming in and how much is going out. It essentially lets you know what you have to work with. Budgets also keep you out of debt. Knowing where all your money is allocated, let's you know if you really have enough for all those purchases you plan on making. They also help you set and achieve financial goals. Deciding as a family to save or spend your money greatly affects what goals you achieve. Communicating and making conscious choices with your money will allow you to get closer to whatever aspirations you have this year with your finances. And lastly, budgets give you peace of mind. I may grumble to myself and feel like I am too busy to sit down and make out my monthly budget, but I grumble a lot more when I don't. Months I don't put in the effort to be accountable, leave me further from the financial goals my family has. I like knowing where our money is going and how we're making it work for us. To start out you need to write down what your income is for the month. Next write down all your need to pay bills... Utilities, rent, food, etc. All the necessities of life. Save any extras, like eating out, for later. We need to first make sure you have enough money for the basics. Once you have everything written down, check to make sure your income covers all expenses. If it doesn't you need to cut the fat....Meaning stop cable, internet, shop around for insurance, etc. Cut anything you can to keep you in the black. Now move onto the spreadsheet. Input all your expenses and income into the spreadsheet. I like using a spreadsheet because it deducts everything for you. I have included a link to a google budget template. This is the same template I use for my family. It is customizable too! Save a copy onto your google drive, so you can use it too. Customize the fixed categories to meet your needs. Same thing with the variable expenses. If you have money left over, after all your necessities are met, then add categories to your variable expenses and start allocating your money. This will allow you to put money aside for eating out, entertainment, etc. Pick a day each week that you'll sit down and check on your budget. Make sure upcoming bills are paid and add a date into your spreadsheet for when things are paid. Give yourself grace as you budget. It's a learning process, one I'm still learning myself. Take it a day at a time and know you CAN do hard things. The more you work on budgeting, the easier it will become. We're creating healthy financial habits this year and it all starts with the budget. Watch the video for more how to tips and encouragement. We got this friends!! Thank you again Danielle. I like your google doc. I love how you always say " What works for your family" Each family is different. Thanks again. BTW, I started your book. It is really interesting. When are you coming t with Part two? Hi Danielle. I've been following your blog for a long time. Between being inspired by you and Suze Orman and my mom being an accountant, I've always fancied the idea of creating a budget. I have always had a very unstable income, usually making between $300 and $900 a month. A few months out out every couple of years, I bring home a few thousand dollars. Those times are never predictable and neither is any other month. How would you suggest to go about budgeting when income is so variable and unpredictable? Thanks for all of your work and inspiration here on B&D.